An English football fan’s visit to Bermuda turned out to be the trip of a lifetime, with a local tour guide helping the gentleman to make contact with one of his sports idols – and when legendary footballer Clyde Best heard one of his fans was on the island, he took the time to meet him personally. Visitor John Carey — a self-professed fan of West Ham and Clyde Best — was enjoying an island excursion with Byways Tours, lead by Ms. Heidi Cowen. 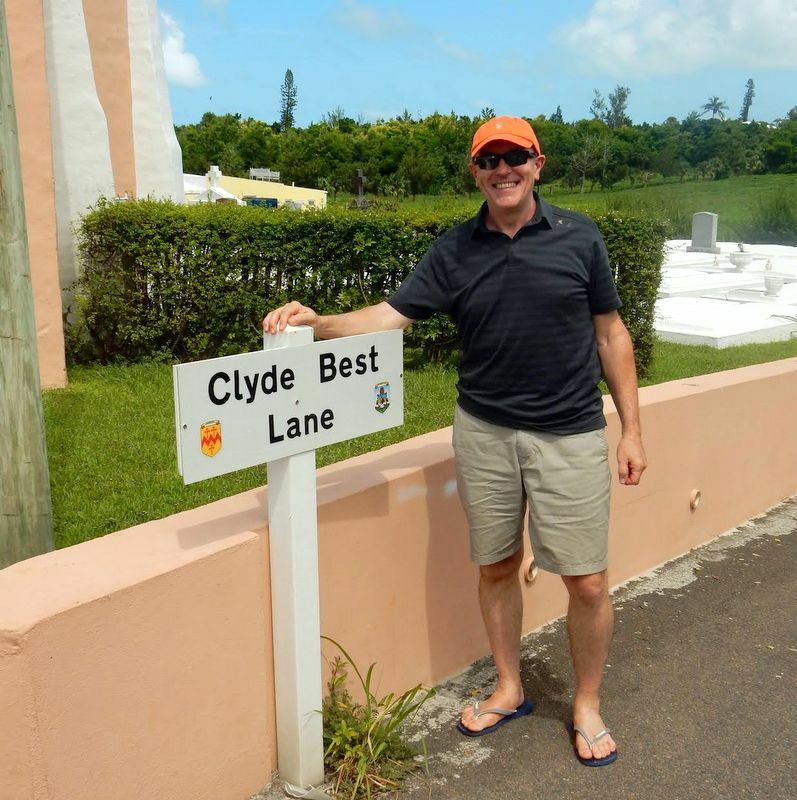 Along the way, Mr. Carey expressed excitement at the idea of getting a photo of himself standing next to the road sign named after Clyde Best, leading Ms. Cowen to arrange a special surprise. Noting Mr Carey’s enthusiasm for having his photo taken with the Clyde Best road sign, Ms. Cowen decided to call Mr. Best on the phone, surprising Mr. Carey with the opportunity to speak with the footballer. And then Mr. Best’s own hospitality lead him to take the encounter a step further, going to the visitor’s hotel in order to meet his personally, spending time with Mr Carey, something which the football fan called a “fantastic” and “brilliant” experience. In describing how the events unfolded, Ms. Cowen said, “The one request that John Carey had on the tour was to have his picture taken by a sign – Clyde Best Lane in Somerset. Ms Cowen said the tour continued Mr Carey continued to talk about Mr Best, prompting her to actually call Mr Best and explain to him that she was a tour guide, had a guest on the bus that was his “biggest fan” and ask if he would speak to him on the phone. Initially Mr Carey was stunned to actually be given the chance to speak to his football idol, and by time he finished the phone conversation he had a huge smile on his face, and the rest of the tour bus passengers broke into applause. Upon hearing of the unique meeting, Glenn Jones of the Bermuda Tourism Authority said, “This really matters because increasingly the BTA is attracting explorers and adventurous like John Carey, the kind of traveler who wants to experience every inch of the island. “I tip my hat to the two of them and everyone else who does their part to make the Bermuda experience a life milestone for the people who visit us,” added Mr Jones. Mr. Best — one of the top athletes that Bermuda has ever produced — arrived in the UK from Bermuda to play for London club West Ham United in 1968, where he was a stand-out player for the professional team. He played 218 games and registered 58 goals for West Ham over seven seasons between 1969 and 1976, and remains a well-known figure by football fans around the world. Great story. Hats off to Ms. Cowen and Mr. Best for giving a visitor an experience he will not forget. That is the Bermuda I remember! Love that! Thank you Clyde and Heidi for making our visitors welcome. Got the chance to speak with Paddy Crerand last year and after telling him I was from Bermuda the first thing he asked about was West Ham’s hulking striker from the late 60s… Pretty cool to hear him talk about Clyde Best with such good words. Great story! Thank you Mr. Best for being such a great ambassador for our island and I hope Mr. Carey had an amazing time while here in Bermuda! People ask about Clyde Best all over the world! He is an icon! Someone explain to me why he hasn’t been knighted yet! All the other knights would be jealous of Sir Best of course! My family and I are very proud of Heidi who is as true an ambassador for Bermuda as her father, the late W.A. “Toppy” Cowen was during his lifetime. I agree with “My2cents”. The next New Year’s Honours list is being prepared so we are asking to put Mr. Clyde Best’s name forward for the top honour! It’s so wonderful to hear about Bermuda’s best! Way to go Mr. Best and Heidi. You do the Island proud. Great story, and Thankyou Sir. Clyde! Wouldn’t go right with the rebel tour. This and these are true ambassadors for all of us Thank you both. I am sure this will travel far by word of mouth. Heidi, you do Bermuda proud! I am so glad to hear this great story. Proud to be Bermudian!! Bring back the days where we all went above and beyond for each other and for our visitors. Such a wonderful story, it made me a little teary – in a good way, of course! Clyde Best …..for The Best …of Bermuda Award,,,,,,,,,,,,,,qudos to all who made it happen….we are all proud of Our Heroes…..quiet shakers and movers …..male and female…..down through the years….moving on …and moving up. As a young soccer fan of that time, I recall Clyde’s arrival and his start at West Ham. Remember, this was the time of that other Best, George Best, who at the time, was the biggest thing in UK football. Like many, I wondered if Clyde had someone changed his name as a publicity stunt. I soon learned that it really was his real name. I also remember the appalling conditions under which Clyde played, getting abuse from even his own team’s fans. It never appeared to bother him, but I’m sure he felt it inside. I’ve come to view Clyde as a true sporting hero, along with a handful of others like him, having paved the way for racial tolerance in the UK. While all this is very real, I don’t want it to outshine his ability as a great footballer. Hat’s off to you, Sir! Heart warming. Loved reading this and watching the video of the phone call. You could almost touch Mr Carey’s joy. Fantastic !